An investigation has been launched into a “serious incident” involving Air France Flight 953. It was revealed the plane with nearly 40 on board risked crashing into a giant volcano in Cameroon while trying to avoid a storm. France’s BEA air accident agency is looking into what took place on May 2, when the Boeing 777 was en route to Paris. Air France Flight 953 with 23 passengers, three pilots and 10 cabin crew were traveling from Malabo, Equatorial Guinea, to Douala, the largest city in Cameroon. An automatic 'pull up' alarm went off when the plane diverted north from its normal route “to avoid storms,” accident investigators said. The BEA stated in its report that the aircraft ascended quickly from 9,000ft to 13,000ft to avoid crashing. "The Boeing 777-200 F-GSPG was flying at cruising altitude between Malabo and Douala in stormy conditions. The route they took to avoid the storm took their trajectory close to Mount Cameroon,” an Air France statement read. The plane’s proximity was detected by the plane’s warning system, which then generated an alarm in the cockpit. “This system generated an alarm in the cockpit to which the pilots responded immediately by applying the appropriate procedure,” the statement said. 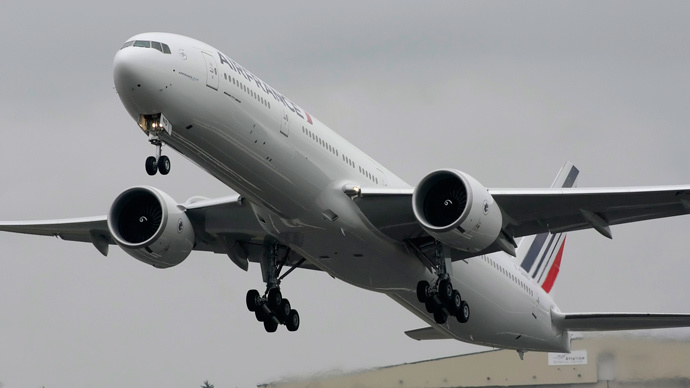 Air France has confirmed the maneuver was carried out in line with training and Boeing guidance. “Pilots receive regular training in this type of maneuver,” it said. The flight continued on to its destination without any further incidents and landed 44 minutes after leaving Malabo. Despite the fact that nobody was hurt and the passengers knew nothing about it, the BEA, under aviation protocols, regards this maneuver as a “serious incident” as it could have lead to a disaster. The cockpit's Enhanced Ground Proximity Warning System issues a staccato command for pilots to sweep up in case of getting too close to the ground except when landing. France made use of this system compulsory after an Air Inter Airbus crashed into Mont Sainte-Odile in France in 1992.